This is going to be a three parter. 🙂 Today, we’ll dig into the core networking capabilities of the HTTP stack for site of origin communication. In the next two parts, we’ll go deep into understanding our HTTP cross domain support. Note: this tutorial has been updated for Silverlight 2 RTW. In Silverlight 2, by default, you are only able to talk back to your site of origin server. This is in line with the general browser sandbox, and is designed to prevent cross site forgery. What Can You Say to Your Site of Origin Server? Also, all the requests you send will have the “right thing happen” to them from a cookies and authentication standpoint. This is a result of us leveraging the hosting browser to make the HTTP request. To implement our Silverlight HTTP stack, we use the browser plug-in’s networking APIs. The HTTP capabilities we expose are therefore bound by the common set of capabilities exposed by the browsers that Silverlight supports. Note: There are other ways we could have implemented the networking stack. For instance, we could have proxied all calls through the browser’s XmlHttpRequest object. However, this would have imposed a site of origin restriction on the requests, and we wanted to enable cross domain communication to existing web services. Similarly, we could have gone directly to the operating system’s networking APIs, but then we would have lost the cookies and authentication integration with the browser. In the future, exploring multiple of these stacks to expose more capabilities is definitely a possibility, and is something we would like feedback on. What APIs Should I Use? There are two APIs in Silverlight for HTTP communication. The first is WebClient and the second is HttpWebRequest. WebClient is a great API with a simple, events-based paradigm. You can use it to easily download or upload a strings and Streams. For a download, WebClient does a GET request and then gives you back the result in the form you wanted. For an upload, WebClient does a POST and sends the data you passed it. It also automatically resolves relative URIs against the deployment URI of the XAP. HttpWebRequest and HttpWebResponse are the standard .NET HTTP apis. They are much more powerful than WebClient but also more complex to use. 13:     // Make async call for request stream. Callback will be called on a background thread. 31:                        + "<title type="text">Entry 1</title>"
32:                        + "<content type="text">This is my entry</content>"
37:    // Make async call for response. Callback will be called on a background thread. 48:     // use response. Could include reading response stream. 54:     // use response. Could include reading response stream. Do the capabilities of our HTTP stack satisfy your needs? What do you think of the API set? We’d love to hear your thoughts. Stay Tuned for Cross Domain Support in Part 2…. Why only GET & POST? I played with the WebClient (http://www.galasoft.ch/mydotnet/articles/article-2008032301.html) and it works well. I welcome that you replaced the Downloader with that object. The Downloader felt a little like a hack. Good move there. I also think that supporting the whole set of verbs (also HEAD) would be a good move. What is the reason to leave them out? Looking forward to the next post about cross-domain. I really feel that the ability to do synchronous communication is essential. The code base of large applications get way too complicated when using asynchronous communication. Just look at your (very small) post example above. With synchronous communications, it would have been a one-liner. In large applications with hundreds (if not thousands) of web service calls that has to be called in specific sequences, this is not maintainable. The burden it places on the programmer with regards to state handling is simply too great for many applications. And of course, it should be posible to do synchronous communications in background threads to avoid blocking the UI. At the very least, I think you should implement a standard way of calling out through the XmlHttpRequest object. As it stands, everybody has to create their own wrappers for this. I know that the XmlHttpRequest is limited in what it will do, but for many (most?) applications it will be enough. Also, you need to support all the HTTP verbs, return the exact status codes from the server, and allow for access to all ports on the server (if the server allows it). I second the missing PUT and DELETE verbs problem. WTF?! Also, why restrict the supported status code either – double WTF?! I see Silverlight as finally enabling the creation of an awesome RESTful client – why cripple it? I hope there is still time to fix these before 2.0 RTMs. In which case PLEASE can we have some way to switch back to using XmlHttpRequeset under the covers? I need PUT and DELETE. I need access to a full HTTP spec implementation. Sure, for cross-site access limit me to GET/POST, if that’s what you need to do. But please do not limit the 80% use case (for me) which is talking to my own server! First, thank you everyone who has both read and commented so far! As Andrew pointed out, the verb, status code and other HTTP capability limitations bound by the fact that the browser plugin networking APIs do not support things beyond what we’ve exposed. We wanted to use the browser stack (in order to get browser-enabled caching, auth, cookies, etc). And we also wanted to enable cross domain support, which meant not using XmlHttpRequest. This left us the browser plugin networking stack. We are definitely evaluating what we can do here in the short term and long term, and your feedback is especially helpful in this area. Also note that you are, if you really need to, able to access the XmlHttpRequest object via the HTML Bridge feature in managed code. After I finish this series, I’ll try to publish a full sample on how to do this. As to supporting asynchronous only requests, this is also a result of browser limitations. The browser plugin networking API only exposes async requests on the UI thread. Enabling a Silverlight synchronous request would result in a deadlock: we would block on the synchronous request and then never get the asynchronous callback from the browser. Moreover, though, the idea of a blocking call on the UI thread (which would affect the entire browser UI) seems like something we don’t want to encourage as a platform. We are looking at expanding what you can do with the WebClient class so as to make certain types of calls easier and reduce the scenarios that someone would need to use the HttpWebRequest class directly. Anyways, thanks again for the read and the comments – keep them coming! >>Why only GET & POST? I think it’s possible to do PUT or DELETE in Silverlight. I think you are talking about HttpWebRequest. AFAIK, there are two options to use other Http Verbs in Silverlight. 1. You can simply use HttpWebRequest. Note: Honestly, I’m not so sure whether I have tested it or not. I think it will work. but the important thing is that you should use IIS for web service instead of VS development server. If I remember correctly, there are some problems in response code. 2. You can use XmlHttpRequestWrapper. I used Http “DELETE” for deleting the data from Astoria. I haven’t implemented for updating yet since there was some problems at this point. There are unbelievable interesting in Astoria. 3) we have to use “application/atom xml” for updating the whole properties of object at a time. but supporting “DELETE” or “PUT” is not that important since there might be some firewalls that don’t allow those requests..
From Astoria point of view, we are able to use “POST” instead of “PUT”. The POST request with this URL http://localhost:52976/SL2Astoria_Web/WebDataService.svc/Products(16) is for updating. The POST request with this URL http://localhost:52976/SL2Astoria_Web/WebDataService.svc/Products is for inserting. Limited HTTP verbs and minimal HTTP Status codes makes Silverlight a non-starter for anyone building scalable rich clients that support intermediaries like caching proxies. – Tunneling verbs through post (“POST Tunneling”). Many firewalls today only allow GET and POST verbs through. treats that request like a DELETE. – Returning errors in the response stream. We definitely understand that these limitations are less than ideal, but hopefully after reading this post, you have a better understanding of why certain tradeoffs were made in the SL2 timeframe. I’ve been playing around with HttpWebRequest and doing POST operations with doubly async gets tricky. Relatively easy for single files, but if you want to capture information on POST status and sizes there’s nothing that provides this (unlike the full .NET stack which does based on feeding the stream). The workarounds for this are horrendous (Wilco’s Upload component is a good example of the complexity involved). 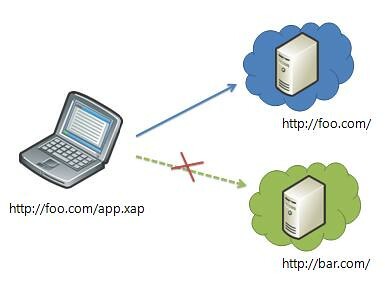 While a specialty scenario I too feel that HTTP operation – even if it’s a more complex scenario – should be easier because it’s the lifeblood of a thin client application. One of the key scenarios will be to send data back and forth and status information is a key scenario for this IMHO. The GET / POST methods are okay, since we can use the x-http-method-override pattern. I am concerned about the limited support for HTTP response codes. How would we handle a 401 to implement security? A real world example of something I am working on is to consume RESTful services in a SilverLight client via a server, which is secured using digest authentication. It would seem awkward to navigate to the web server and be prompted with the browser’s default credentials dialog prior to even downloading the SilverLight application. How would we do this in a cross-domain scenario? I also noticed that the WebClient class does not even have a Credentials (ICredentials) property like the full framework. Interesting, and i see why you when this route. What I would like to see is example of searching and downloading YouTube videos. I believe these API are created to build RIA sites that consume you own content, but not the content from other sites, or at least friendly sites. IS THIS TRUE? if not can you provide a simple example? WebClient ignores HTTP headers concerning the encoding of the response. This means that UTF-8 response will incorrectly be decoded using whatever is the default system code-page (and thus break extended characters very easily in an internationalization-dependent fashion). This is most unfortunate; HTTP supports the specification of a character set via the MIME type (or an explicit header) – is there a chance this will be fixed? Concretely, unless a developer is extremely careful, using WebClient will result in a broken program depending on where the silverlight app is run, and even if the developer is extremely careful, it’s not possible to perform a robust http request using WebClient; instead, a rather complex series of fallbacks must be implemented using HttpRequest. Even without encoding auto-detection, such an implementation is needlessly error-prone and difficult to test, and as such would be a prime candidate for inclusion in WebClient (which seems to be intended to be simple, after all). Thanks for this post. I built a File Upload tool in Silverlight 2 beta 1, and just recently ported it to beta 2. Your article was very useful to me when I reworked the client/server communications, I use WebRequest together with a helper class I built to invoke PageMethods in ASP.NET pages. The changes from beta 1 to beta 2 (requests now running in their own thread etc) gave me headaches, but thanks to your post I could solve the problems! In your post, you show the use of custom headers and in the reply. You also seem to point to them as a work around for other limitations (X-HTTP-Method-Override). However, when I actually try to use a custom header in Silverlight, it bombs. Remove the custom header and all is good (except of course you can’t do what you are trying to accomplish). Is this something that is supposed to work or was it intentionally left out? The fact that Silverlight has limited features is no problem for me – I understand that with a smaller runtime you get less features, and I am grateful for the Silverlight alternative to WPF. A workaround is easy enough once you know where the problem is. and it didn’t tell me of the limitations so I just kept plugging away. So please keep your help files up to date and don’t forget to include the bad news.